With so many ‘ultra villas’ in Bali nowadays boasting all the bells, whistles and 80-plus-inch televisions, it’s always nice to stay in a grand old villa like Batujimbar, a classic example of the original Bali style, where the sizzle is in the foundations and the history, and not the marketing. Batujimbar comes from a time when wealth and grandeur was wrapped up in simplicity and we revelled in it. Knowing that this was the place of choice for the likes of Mick Jagger, and chums, makes it somehow just a little more special, too. Celebrity hype aside, the physicality of the villa is magnificent in its own right. It ticked all the boxes for us and it was a real pleasure to stay here and take a trip back in time. The grounds are huge, the bedrooms super-comfortable and the gardens are overflowing with trees and flowers under a tropical sun, with the beach just beyond the front gate making for a most relaxing stay. Oh, and the food served from the villa’s kitchen is something else! We wanted for nothing at Bayu Gita Residence. 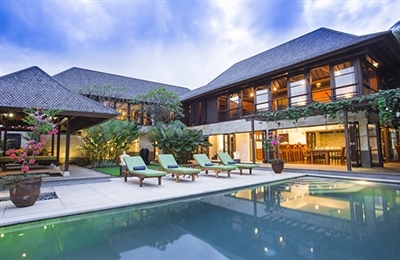 The villa blends all the charms and appeal of a contemporary beach house with the stylish luxury of Bali villa living. Thoughtful design, graceful Balinese aesthetics, natural building materials, the friendliest of welcomes, and what seems like great feng shui, all conspire to create an atmosphere that is warm and inviting, and we felt right at home from the moment we walked in. While the design itself is delightfully simple and unpretentious, the luxury is in the details, and it is abundantly clear that no expense has been spared in creating this tasteful abode. Interiors are refreshingly uncluttered – decoration seem unnecessary when the lavish finishing’s of the villa are themselves a work of art; from richly-hued dark timber latticed panels and highly detailed stone work, to delicately beaded cushions, swishing burgundy drapes and gorgeous framed textiles. The beautiful white flowers that dangle from the vine-covered trellis on the patio add a touch of whimsy. While the property is not huge, the space had been wonderfully utilised, and the open design makes it feel really fresh and spacious, especially with the sun streaming into the garden and all the doors thrown open to the sea breeze. Expansive views from the upper floor, with tantalising glimpses of the sea, add to the sense of space. 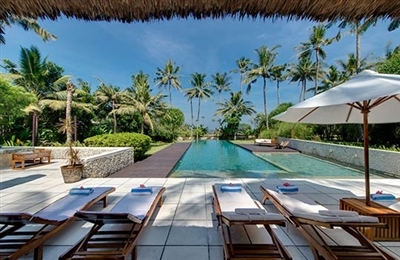 There’s no doubt that, when rented in conjunction with its big sister, six-bedroomed Villa Bayu Gita, Bayu Gita Residence would make a wonderful and very memorable beachside wedding venue. The first thing we noticed on entering Villa Samadhana was the wide open space, rarely seen these days in the more popular tourist centres of Bali. The kids ran a good 70m sprint from the entrance up to the living area, across manicured lawns and past flowering trees. Being a family of four, we had our choice of three separate sleeping pavilions but, as our youngest still wakes in the night, we opted for the master suite so we could be close together. With a king-size bed in the sleeping chamber and upholstered couches in the adjoining sitting room, the kids were excited about sleeping in an unconventional, yet comfortable space – especially with access to their own 32-inch flat-screen television. The owners obviously love to spend quality family time here and the poolside pavilion is a well thought out covered area that provides unlimited opportunities for action, relaxation and play for the entire group. With a 25m lap pool, generously sized shallow area for toddlers, inflatable pool toys and four umbrella-shaded sun loungers, this was our ‘go to’ spot each day after breakfast. The butler and his attendants soon realised that our small, low maintenance group didn’t require them at our beck and call all day and discretely left us to our own devices until we needed them. However, the villa’s extensive amenities and big team of full time staff are perfect for large groups and special events such as weddings. And chef Wayan is a magician in the kitchen. He and his team took care of the grocery shopping before our arrival, based on our selections from the vast menu emailed to us. As a first night surprise for the kids we’d ordered ice cream sundaes and banana splits - the perfect treat before watching a family movie in the air-conditioned media room. 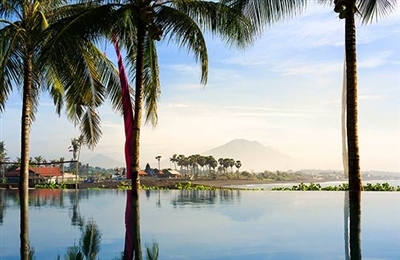 The Pabean Beach area serves up a refreshing slice of unhurried Balinese life. Our daily strolls to the beach provided glimpses of an authentic village lifestyle: local children laughing and playing on the glittering, black-sand beach, elderly men chatting beneath their shady roadside shelters and ibu (mothers) skilfully wielding long, skinny sticks to knock down frangipani blossoms for daily prayer offerings. 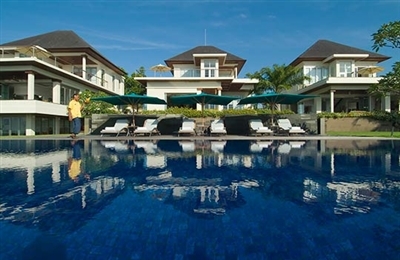 Sanur Residence is very modern in design, simply furnished but very comfortable. Although the houses may not have the rustic ambiance of traditional Balinese villas, they make excellent beachside holiday homes. To us it looked as though each house is owned by a different member of the same family so has taken on a different personality within ostensibly the same frame. The middle house (House Two) has mature furnishings and an older feel with some interesting art and sculptures. At the other end of the spectrum is House Three – young and vibrant with pink and grey soft furnishings in the lounge, bright art on the walls, and a private media room. House One falls somewhere in between. That said all the bedrooms are large and very comfortable (especially the master suites) and have huge modern, very practical terrazzo-finished bathrooms. Each house has perfectly acceptable facilities including TVs, cable and DVDs throughout, and good common spaces. The house kitchens are small - just service or snack kitchens, the bulk of the cooking is done in the staff kitchen and delivered to the house. We thought it odd that ther is no obvious place for communal dining except for in the rather formal meeting room. The staff did say, however, that they are happy to set up tables out on the lawns, which we can imagine would be great for a barbecue.